About 450 species of ladybugs (or lady beetles) exist in the United States and Canada. As a general rule, most ladybug species are extremely beneficial insects. Ladybugs feed on other insect pests, such as aphids, mealybugs, scale insects, mites, and other outdoor plant pests. However, certain species of ladybugs not native to North America have been introduced as biological controls to serve agricultural interests. One of these species, the Asian ladybug (Harmonia axyridis), was introduced back in 1980 by the U.S. Department of Agriculture in the Yakima Valley of Washington state as a biological control for aphids. 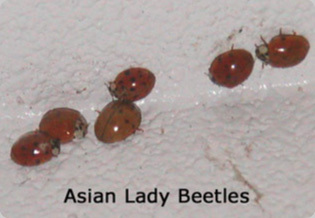 Eventually other introductions of these Asian ladybugs, coupled with ideal environmental conditions, mushroomed their numbers to the extent that these Asian ladybugs not only overwhelmed local native species such as convergent and transverse ladybugs but they began to overwhelm many local homes as well during the fall and early winter months in various areas of the Northwest. Asian ladybugs can be identified from other ladybugs by what appears to be a dark “W” on their mostly white colored pronotum behind the head. Other ladybugs have different marking characteristics. During the fall months, Asian ladybugs seek out shelter to hibernate. These areas typically include under rocks, landscape timbers, and under leaves. However, these bugs have increasing been attracted to the sunny exterior sides of buildings in a fashion similar to box elder bugs. In sufficient numbers, Asian ladybugs find themselves inside a dwelling, where they can leave a yellow, odorous stain on walls and furnishings that is extremely tough to remove. The stain is actually a chemical called pyrazine that serves as a natural defense against would-be predators. When frightened or molested, the ladybugs will secrete this staining chemical for protection. Corrective measures: Inspect the home to ensure that all roof and weep hole vents outside the home are well screened with 16-mesh screening. Caulking cracks around windows, doors, overhangs, fascia boards, etc. is also advisable. Inside, seal around windows, behind electrical cover plates with insulation foam and ceiling light fixtures around the base plates with appropriate sealant can also help. If Asian ladybugs get inside, one of the best ways of removing them without spraying is with a vacuum cleaner. Dispose of the vacuum bag or empty the vacuum cleaner’s contents outside immediately after vacuuming the bugs to prevent inadvertent reintroduction of the pests. It is not advisable to randomly treat these bugs with insecticides inside the house as the dead bugs can attract carpet beetles inside to eat the carcasses, thus one indoor pest problem may be simply traded for another. If the pest problem becomes too acute, it may be advisable to consult with a pest management professional for expert advice and solutions. Leupitz Pest Control has had experience in dealing with the excessive populations that attempt to invade homes and can provide advice and solutions to deal with these insects.